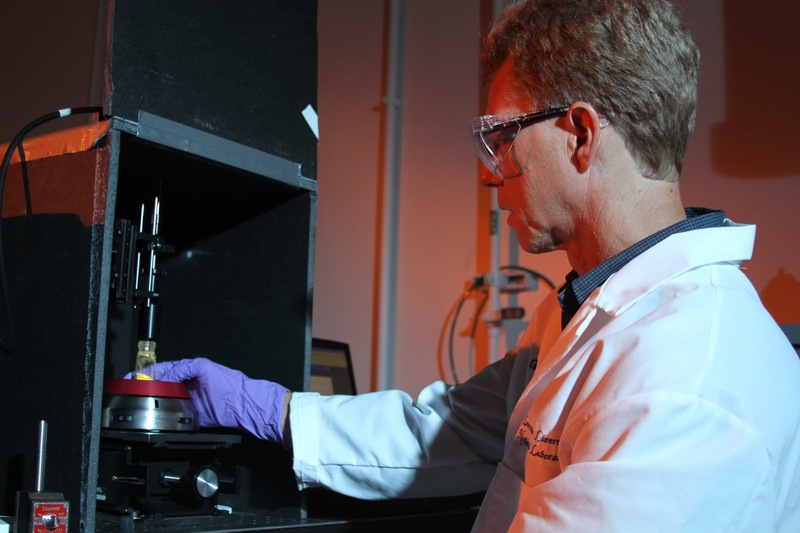 A team of Lawrence Livermore National Laboratory (LLNL) researchers has pioneered the use of a long-standing technology for a new application—analyzing the chemical composition of uranium samples. In a paper published as the cover story in the September edition of Applied Spectroscopy, the Laboratory scientists describe the first reported use of near-infrared spectrometry to study the chemical properties of uranium ore concentrates (UOC), also called yellowcake. Near-infrared spectrometers were first used in industrial applications in the 1950s and have been utilized for medical diagnostics, combustion research, pharmaceuticals and other uses, but not for studying uranium ore concentrates. The instrument measures the color, intensity and wavelength of light or reflected light. It is believed that this technology could rapidly provide information on the origin of uranium samples to law enforcement officials who interdict smuggled materials and could be useful in preventing future trafficking from those sources. For years, one of the primary methods used for determining the different types of uranium has been a simple visual color inspection by researchers. However, visual determination is subjective and no chemical information is provided. "I was recently in a lab with two other researchers looking at uranium ore concentrates," said Greg Klunder, a chemist in the Lab's Forensic Science Center and the paper's lead author. "I saw the sample as gray, another saw it as brownish and a third as green. "We used a visible near-infrared spectrometer to test the color. In the near-infrared region, we saw a spectrum consistent with chemical information and the thought came to me that we could use this for evaluating uranium ore concentrates." Other Lab scientists who collaborated on the paper were: Pat Grant and Paul Spackman, chemists at the Forensic Science Center; Rachel Lindvall, a chemist in the Chemical Sciences Division; Ian Hutcheon, a group leader in the Chemical Sciences Division; and Jonathan Plaue, a doctoral student in the University of Nevada, Las Vegas radiochemistry program. In addition to the simple, color-based inspection, several other methods—including X-ray diffraction and mass spectrometry—are used to analyze UOCs, but these techniques require sample preparation that can significantly compromise the uranium samples. "The rapid non-contact, non-destructive analysis of UOC materials using near-infrared spectroscopy provides a technical scientific basis for the attribution of a sample that is more valuable than the more subjective evaluation of visual color," the LLNL scientists said in their paper. "Near-infrared spectroscopy provides chemical speciation information without consuming or contaminating the sample, thereby enabling supplemental and uncompromised subsequent analyses," they added. The near-infrared area is a region in the electromagnetic spectrum that encompasses the wavelengths of light just beyond the visible region, from about 700 to 2,500 nanometers, or billionths of a meter. UOCs are produced at mining facilities from the various types of uranium-bearing ores using several processes that can include different reagents, separation procedures and drying conditions. The final UOC products can therefore consist of different material signatures in the uranium, which are important to identify to trace interdicted samples back to their origins. The authors believe further investigation will be needed to understand other chemical properties of the uranium ores that can be detected with near-infrared spectroscopy and to evaluate the different phases of the ores.